"Sun" redirects here. For suns in general, see Star. The Sun or Sol is located at the gravitational centre of the Sol System. The Sun will eventually collapse upon itself sometime after the year 1 000 000 000 and it will destroy Earth with it. In the game,Disputed canon there is a civilization in the sun. They apparently have developed heat proof buildings, as well as the abilities to swim in lava, and shoot fire balls. 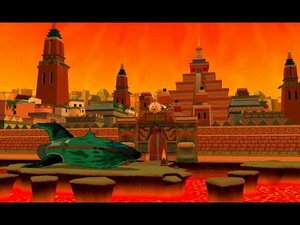 There was a city on the sun ruled by Ra-Ra the Sun King. Ra-Ra nearly lost his leadership when a being claiming to be the Sun God tried to overthrow him and seize control of the star. It is most likely that all life on the Sun have died, as the Temple was destroyed. While the Sun appears to be inhabitable, conditions upon which humans can coexist appear to differ, at one point a version of The Real World was shot there, however one of the contestants, could be heard screaming that he's burning to death. 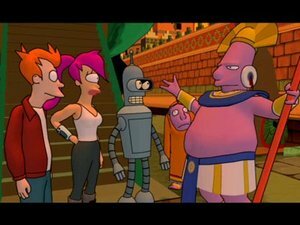 In the game Fry, Leela, and Bender could exist. However, on a later trip, they needed devices to allow them safe passage. While the Sun appears in the background of many episodes, only important appearances are listed here. This page was last edited on 22 March 2014, at 22:51.